The adage that dead men tell no tales has long been disproved by archaeology. Skeletons that may represent the remains of crew members from Columbus’ second excursion to the New World in 1493-94 were exhumed in 1990 by archaeologists from Italy and the Dominican Republic. The burials were a part of La Isabela on the island of Hispaniola, now a part of the Dominican Republic and that was the first European settlement in the New World. Now, a chemical analysis by UW–Madison archaeologist T. Douglas Price and colleagues of the teeth of these skeletons promises details of the individuals early life history, showing where they were born and what they ate, information that promises to reveal new clues about the first European explorers of the New World. Now, however, science is taking interrogation of the dead to new heights. In a study that promises fresh and perhaps personal insight into the earliest European visitors to the New World, a team of researchers from the University of Wisconsin–Madison is extracting the chemical details of life history from the teeth of crew members Christopher Columbus left on the island of Hispaniola after his second voyage to America in 1493-94. “This is telling us about where people came from and what they ate as children,” explains T. Douglas Price, a UW–Madison professor of anthropology and the leader of the team conducting an analysis of the tooth enamel of three individuals from a larger group excavated almost 20 years ago from shallow graves at the site of La Isabela, the first European town in America. Price and colleague James Burton, in collaboration with researchers from the Autonomous University of the Yucatan in Mexico, are attempting to flesh out the details of a colony that lasted less than five years. The human remains used in the study were buried without the formalities of coffins or shrouds, and were excavated from what was once the church graveyard of the town Columbus established. Headstones and other identifying markers have long since faded to nothing or have been lost entirely during the 500 years since the bodies were first interred. Despite its brief existence, historians and archaeologists believe La Isabela was a substantial settlement with a church, public buildings such as a customhouse and storehouse, private dwellings and fortifications. It is also the only known settlement in America where Columbus actually lived. Although the town has been the subject of previous archaeological studies, the work by Price, Burton and their colleague Vera Tiesler and Andrea Cucina of the Autonomous University of the Yucatan is revealing new insight into the people who lived and sailed with Columbus, and who died on the shores of a strange and exotic new world. Histories of La Isabela, named after Spain’s queen and Columbus’s patron and located in what is today the Dominican Republic, suggest its population was made up only of men from the fleet of 17 vessels that comprised Columbus’s second visit to the New World. But the first analysis of the remains of 20 individuals excavated two decades ago by Italian and Dominican archaeologists portray a different picture, suggesting that living among the Spaniards at La Isabela were native Taï¿½nos, women and children, and possibly individuals of African origin. If confirmed, that would put Africans in the New World as contemporaries of Columbus and decades before they were believed to have first arrived as slaves. The study conducted by the Wisconsin researchers relied on isotopic analysis of three elements: carbon, oxygen and strontium. Carbon isotope ratios provide reliable evidence of diet at the time an individual’s adult teeth emerge in childhood. For example, people who eat maize, as opposed to those who consume wheat or rice, have different carbon isotope ratio profiles locked in their tooth enamel. “Heavy carbon means you were eating tropical grasses such as maize, found only in the New World, or millet in Africa, neither of which was consumed in Europe” at the time, says Burton. Oxygen isotopes provide information about water consumption and also can say something about geography as the isotopic composition of water changes in relation to latitude and proximity to the ocean. Strontium is a chemical found in bedrock and that enters the body through the food chain as nutrients pass from bedrock to soil and water and, ultimately, to plants and animals. The strontium isotopes found in tooth enamel, the most stable and durable material in the human body, thus constitute an indelible signature of where someone lived as a child. Three of the individuals whose teeth were subjected to isotopic analysis by the Wisconsin group were males under the age of 40 and who had carbon isotope profiles far different from the rest, suggesting an Old World origin. “I would bet money this person was an African,” Price says of one of the three individuals whose teeth were subjected to analysis. It was known that Columbus had a personal African slave on his voyages of discovery. The new analysis could mean that Africans played a much larger role in the first documented explorations of America. The strontium isotope analysis, Price notes, is not yet complete, as samples from the teeth of the presumed sailors remain to be matched with strontium profiles of Spanish soils. However, such matches could open an intriguing window to the personal identities of individuals buried in La Isabela. 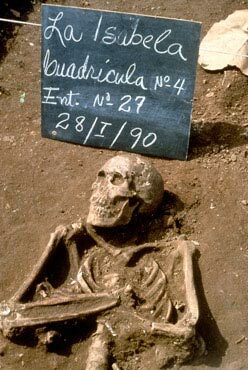 The skeletons also exhibit evidence of scurvy, a common affliction of 15th century sailors who lacked vitamin C on their long voyages, as well as signs of malnutrition and physical stress. Chronicles of the voyage noted that most of the Europeans, including Columbus himself, fell sick shortly after landfall on Hispaniola, and many subsequently died, perhaps becoming the first to be buried in the La Isabela church graveyard.